Our commitment to the fuzzy yellow ball game extends across four planks: sponsorship of major pro tournaments, encouragement for young talent, support for amateur tennis and, last but not least, for goodwill tennis – which reflects our profound commitment to society. In Belgium we sponsor some fifty tennis events. The focus lies on promoting the talent of the young. This is why we support several tournaments like the Iris Open 9 in Ganshoren, the Iris Anderlecht Cup, the Havré Fair-Play Trophy, the Open 9 in Huy, the international junior championships (Astrid Bow Charleroi), the IFT $10,000 KTC Eupen, the WTA Flanders Ladies Trophy at the Koksijde seaside resort and the Rising Stars Tennis Tour summer tournaments held at various venues along the Belgian coast. By the same token, we have forged an alliance with Hope & Spirit, a foundation that guides and financially supports young people in their efforts to combine their studies with their passion for tennis. We also support Start to Tennis, a Tennis Vlaanderen project which aims to help adults find a home in the welcoming world of tennis. Not just the stars on the international circuit but all the players, whatever their age, whether they are able-bodied or disabled, embody the values of the sport of tennis. This is why BNP Paribas also strongly supports the development of wheelchair tennis. 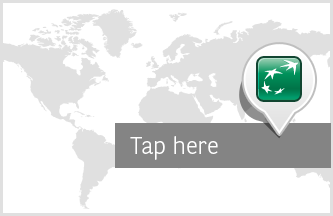 Since 2009 BNP Paribas has been official partner of the NEC Wheelchair Tennis Tour and since 2012, title sponsor of the BNP Paribas World Team Cup. 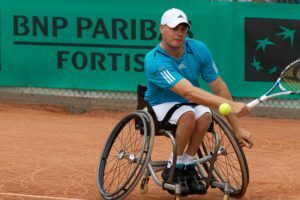 In Belgium, we are a partner in four wheelchair tennis tournaments: the Belgian Open in Géronsart (near Namur), the Ath Open International, the Westend Wheelchair Tennis Tour and Flanders 25 in Aalst. Last but not least, thanks to our efforts, tennis, which performed as a demonstration sport at the 2011 Special Olympics, ranked as an official sport at the ‘Games of the Heart’ in 2012. We were a partner of the 2013 Special Olympics edition in Ghent and via BNP Paribas Fortis Foundation we also supported the organisation of the 2014 Special Olympics European Summer Games in Antwerp. Rebirth of the BNP Paribas Fortis Diamond Games – After seven years, world-class tennis came back to Antwerp through the BNP Paribas Fortis Diamond Games which were held at the Sportpaleis from 9 to 15 February 2015. This ladies tournament is a Premier event – the first in the season in Europe – with prize money of $ 710,000. In the tradition of the past, at stake in the tournament is a gold, diamond-studded racquet. Made from 4.5kg of gold and 2008 diamonds, it is worth 1.5 million dollars. The player who manages to win the tournament twice in three years will get to take home the racquet. Amélie Mauresmo accomplished this great feat in 2007. 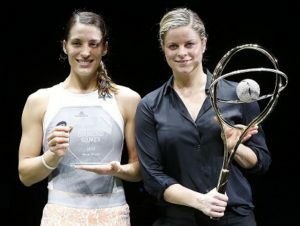 Andrea Petkovic, who won 2015 edition of the BNP Paribas Fortis Diamond Games, and tournament director Kim Clijsters, holding the prestigious gold and diamond racket. Carla Suarrez Navarro had to forfeit the final due to an injury. About 31,500 visitors attended the first edition of the revamped tournament. First edition of the BNP Paribas Fortis Belgian Tennis Trophy – In late November 2014, the Country Hall at Liège hosted the first edition of the BNP Paribas Fortis Belgian Tennis Trophy, with the Belgian Davis Cup team members as headliners. Belgian No. 1 David Goffin won the exhibition tournament. Olivier Rochus, who retired from professional tennis, was honoured in an-court ceremony for his 15-year tennis career. Both the BNP Paribas Fortis Diamond Games and the BNP Paribas Fortis Belgian Tennis Trophy are perfect opportunities to promote international tennis in this country. Thanks to these partnerships, we can add punch to our slogan ‘We Are Tennis’ and put tennis in Belgium firmly on the map again.